Also released under the strange title "The Earth Ritual Preview" with a different cover art, "Night of the Hawks" was a project initiated by former lead signer Robert Calvert. With Dave Brock, they wanted to create a studio brother to the well-known 70's double live album "Space Ritual", with the participation of ex-members. However, the project was aborted, and this EP gathers its only few recordings sessions. Nevertheless, after the errance of the 1982 albums, the inspiration finally comes back. These four tracks are quite good and each one shows a particular facet of the band: aggressive, ambient, electronic and fantasy. The heavy space metal title track is in direct lineage of the thundering "Levitation". Featuring Lemmy at bass and vocals, this powerful tune is one simply one of the best compositions of the Hawks during the 80's! The hazy ambient song "Green Finned Demon" is quite ahead of its time and will be interpreted live in more electronic versions. "Dream Dancers" is a short synthesizer sequenced transition, in the dark style of John Carpenter's "New York 1997", whereas the heroic fantasy "Dragons And Fables" is the other highlight of the disc. This enchanting track will be interpreted live in a enhanced version on the "Live Chronicles" double album. 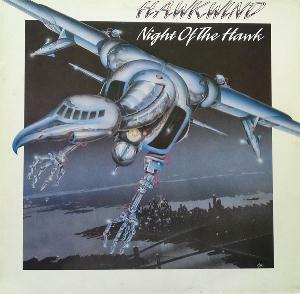 Despite its short length, "Night of the Hawks" is therefore important in HAWKWIND's discography, as it features three essential eighties songs of the band that will often be played at concerts. Furthermore, this EP is a turning point for the Hawks, the composition quality and focus have (at least) returned. Mandatory for every fan of their 80's material. NOTE: This EP is now included on certain remastered versions of "The Chronicle Of The Black Sword"